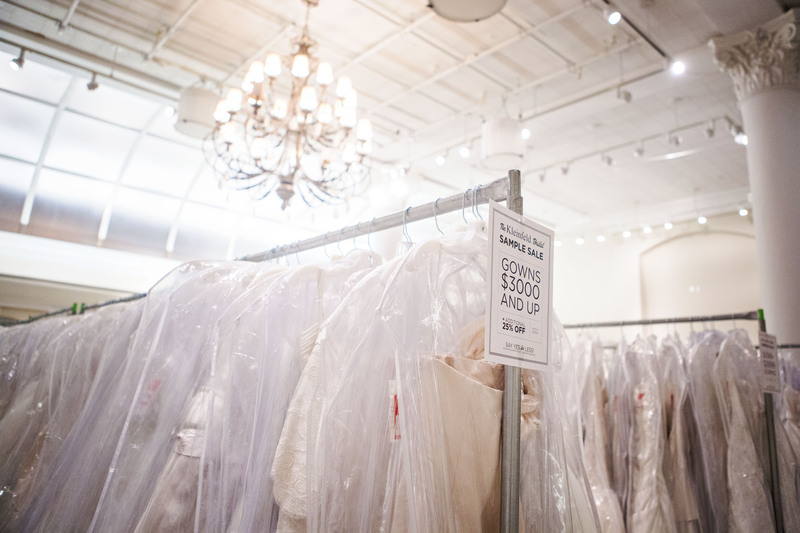 Have questions about the Kleinfeld Sample Sale? We’ve got you covered. Learn everything you need to know about finding the perfect sample dress (and/or accessories) at one of our famous sales. If you haven’t already, book an appointment. This year we’re skipping the long lines and chaos by making the sample sale by appointment only. This guarantees you’ll have the one-on-one experience that every Kleinfeld bride deserves. Upon arrival, you’ll be greeted by one of our consultants and brought back to your private dressing room. Once everyone is settled, your sales consultant will guide you toward dresses that fit your wedding day style. You’ll browse the racks together and try-on your favorites. Appointments are an hour & a half long, which goes by faster than you may think. To make the most of your appointment, try to strategize ahead of time. Even if you haven’t tried on dresses yet, it’s good to have a general idea of what you’re looking for. Start by browsing photos online. Think about your favorite silhouettes, embellishments, lace vs. beading, or think about what ‘feeling’ you’re going for on your wedding day. Narrowing down these 3 starting points will help you and your consultant find the perfect dress. Last but not least—don’t be discouraged if you don’t find “the one”! Your consultant will be happy to book another appointment with you.